Ladies, do you ever feel like this (minus the bodice drama)? 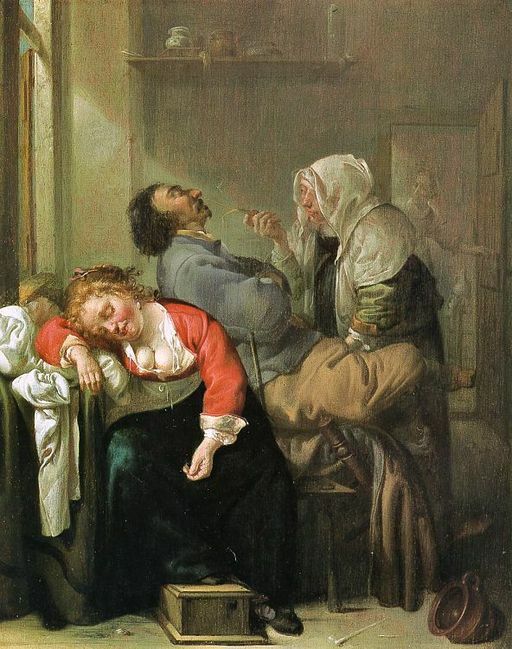 Guys, do you ever nod off mid-sentence? Do you spend half your life asleep on the couch? There are lots of reasons for feeling tired, run-down, and chronically exhausted, but the one I’m going to focus on is iron-deficiency anemia. Anemia is one of the most common adult presentations of celiac disease and the prevailing symptom of that type of anemia is overall fatigue—as in reduced physical work capacity, impaired athletic performance, and a funky attitude. Who wants to shuffle through life bleary-eyed and drained of energy (not to mention unaware of potential wardrobe malfunctions)? In order to have the energy you need to enjoy life and thrive, you need healthy, functioning red blood cells (RBCs). RBCs contain an oxygen-carrying protein called hemoglobin, which is the pigment that gives blood its red color. Heme is the iron-containing component, globin is the protein. Unlike most cells, mature RBCs have no nucleus. That way there’s more room to cart around the oxygen you need to work, chase your kids, climb mountains, play tennis, and walk the dog. RBCs only last about 120 days because of the wear and tear they take zipping around the body, squeezing through capillaries, exchanging oxygen for carbon dioxide, and supplying all our cells with nutrients. Capillaries are the microscopic blood vessels between arteries and veins. They’re called exchange vessels and are found near almost every cell in the body, but their number varies depending on the oxygen and nutrient needs of the tissue. Muscle tissue has lots of capillaries because of the high metabolic demand, especially if you’re an athlete. The same goes for your hard-working liver. If all the capillaries in the human body were placed end to end, the collective length would be about 25,000 to 30,000 miles. Now, imagine how busy your little RBCs are and how many miles they put in each day keeping you upright and functioning. Incredible, isn’t it? As I mentioned before, RBCs wear out after about 120 days. In order to maintain healthy numbers, we need to be cranking out new mature RBCs at the rate of at least 2 million per second. Yes, you read that right. TWO MILLION PER SECOND. And each RBC contains about 280 million hemoglobin molecules (no typo, 280 million). Each hemoglobin molecule can carry up to 4 oxygen molecules. Seriously, tell me you’re not totally impressed with yourself. Aren’t we amazing? Here’s the deal, though. We need to provide our bodies with stellar building blocks to make all this magical stuff happen as planned. Plus, we need to make sure we don’t have something sabotaging our good intentions. Something like celiac disease, which when undiagnosed or unmanaged, can cause nutrient malabsorption so we don’t get the proper building blocks (like iron and animo acids) we need to make all these red blood cells. Bottom line (short-story version)? If you’re not absorbing your iron, you can’t replace your lost RBCs. If you can’t replace the high rate of RBC loss, you’ll end up with a reduced number of RBCs, a decreased amount of hemoglobin, and less oxygen-carrying capacity. In other words, you’ll be chronically fatigued, have a bad attitude, and simply getting through your day will be a monumental effort. That’s no fun. First off, find out if you have iron-deficiency anemia. Poor absorption of iron (could be celiac disease), excessive loss of iron, increased iron requirements, or insufficient dietary intake can cause the condition. Celiac disease fits into that scenario, so make sure to consult a medical professional and get tested before taking supplements. Too much iron is toxic and can accumulate in body tissues and organs after normal needs are met. Getting your nutrients from food should be your priority unless you have a verifiable deficiency. Here’s a list of iron-rich foods. If you’re an athlete, especially one with celiac disease, your iron-related concerns may be compounded. Add foods from this list to your diet and if you want to know more about athletically-induced, iron-deficient anemia, leave me a comment at the end of this post. 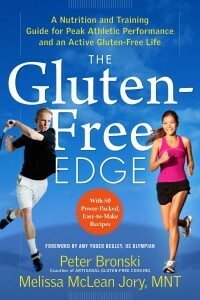 Your reward for sticking with me to the end of this post is a chance to win a copy of my book, The Gluten-Free Edge: A Nutrition and Training Guide for Peak Athletic Performance and an Active Gluten-Free Life, co-written with endurance athlete, cookbook author, and good friend Peter Bronski of the blog No Gluten No Problem. We go into great detail about nutrient absorption, iron loss, and the critical role deficiencies play in overall health and athletic performance. I’ll choose one winner in a random drawing. This book is a great guide for anyone who wants to “gain an edge” in life and in sports by going gluten-free. Plus, it makes a great Christmas present. * My favorite sources for uncontaminated, certified gluten-free oats are Montana Gluten-Free Processors and Gluten-Free Prairie (same oats). These oats are rich in iron and protein, making them good building blocks for RBCs. Are you curious if you get iron from using a cast-iron skillet. Check this post of mine for the geeky details: Heavy Metal Skillet Breakfast. Peace, love, and the Gluten-Free Edge. PS Leave a comment for a chance to win and make sure to add your email address (it won’t be seen), so I can contact you if you win. You can also check in with Pete and me on Facebook and/or Twitter. We share lots of good information. This entry was posted on Thursday, December 6th, 2012 at 4:30 am	and is filed under Artful Aging, Celiac & Gluten Intolerance, Nutrition Therapy. You can follow any responses to this entry through the RSS 2.0 feed. You can leave a response, or trackback from your own site. Thanks for your comment, Sarah. Yes, sometimes it’s hard to figure out whether being a mom of little ones is the sole reason for feeling “run down,” but mixing in gluten intolerance with all that you’re doing makes for a double whammy! As someone who has recently gone gluten/dairy free due to other severe health issues, I LOVE the information you have available! Thanks to you and others like you that are reaching out and sharing your knowledge and making going gluten free an easier transition! Ah, thanks sooo much Barb. I really appreciate your kind comments. Well, we’re all in this together and I’m on a mission to share my knowledge and increase awareness. My best to you! This past May, I found out I had severe anemia and went into the hosital for major tune up. Couldn’t believe how well I felt after. I knew I had gotten very fatigued in what seemed like a short time. I almost felt like a new person after. Severe anemia often calls for a major tune up! Hope you’re still feeling good. Glad things worked out. Keep it up! Thanks for the great info, as newly diagnosed with severe gluten intolerance, i appreciate learning and reading info on what to watch for, and good recipes! Thanks for your comment, Terry. I always appreciate knowing people get something out of these blog posts! Great info – thank you. First time on your site, but I know it is not the last, I love the great easy biochemistry lesson you gave with this! I have dealt with Crohn’s Disease and anemia for over 16 years since the age of 14 when I was diagnosed with Crohn’s. At 18 I was diagnosed with a gluten intolerance and have been GF ever since. Unfortunately, I still battle what my doctor calls “Chronic Anemia,’ stating that I will always be anemic because there is a hole in my bucket which will never be able to fill up. I am interested to read what this book has to offer. Thanks for bringing it to our awareness. So sorry to hear about your difficulty with regaining your iron status. Gosh, I have always felt that anyone with Crohn’s should automatically go on a GF, anti-inflammatory diet. I wish docs talked more about nutrition! Thanks for this information. My iron intake is something I think about a lot as a female. It’s always good to get a refresher on the subject. Also, was there a reason you didn’t include the token iron intake veggie: spinach? No, no reason I excluded spinach, and you’re right, it’s a good one as well. Any leafy green veggie is a good choice. Thank you for the great information. I would love to win your book as I keep trying to read the copy from my library, but it is always checked out! Thanks for trying! It’s worth the library wait, but hopefully you’ll end up with your very own copy. It’s a great reference book. I find the link between Anemia and Celiac very interesting. I have been extremely tired in the last few months, and I thought I was overworking myself, or had Mono. Now I’m wondering if it could be Anemia? You should check with your doctor and get tested. You might be overworking yourself, but you also might have a nutrient deficiency adding to the problem. Good luck! The organ meats more palatable. She did go through iv therapy for several months also. Wow, your daughter’s situation sounds like some of the athletes we profile in the book. It’s hard to keep up with college soccer if you’re dealing with nutrition issues. The burgers sound great. Have her cook them in a small cast iron skillet. Great information, well written. I like the “active gluten free” concept – life is sort of an endurance event. Attention to food choices is an important strategy for athletes AND those of us who want to be active. You are SO right! Life is an endurance event and pacing yourself with optimal food and lifestyle choices is key to a successful “race.” Thank you! Great point. Thanks so much for the info Melissa! I’ve been GF for 3 years and continue to struggle with this. It’s always good to be reminded of natural ways to increase my iron beyond supplements. Did you see my post on using a cast iron skillet? Read that one for more ways to boost your iron intake. If you’re not absorbing it, that’s another issue, but if you’re intake isn’t adequate or you’re losing it at a higher rate, a boost in intake will definitely help. Thanks for the great list of iron rich foods. I’m usually on the borderline for anemia so I focus on good proteins and greens. Never thought of beet greens, will have to try that! Thanks Melissa! Beet greens are a favorite of mine. They’re awesome sautéed with a little diced garlic, great on GF pizza, and wonderful in smoothies. I love them!! Wow…our bodies are amazing! Would love to read your boook and your information on anemia and absorption. Yes, our bodies truly are amazing. And the more we realize that, the better we take care of them (hopefully!). Oh, I’d love to win this book for my son! He’s an athlete and he’s gluten free, PLUS he’s doing his governor’s school culminating project on how nutrition affects athletic performance. This would be an awesome resource for him!! And I was anemic — after taking iron for months and blood tests not improving, my doctor had me do the gluten sensitivity stool test to figure out if that is why I was not absorbing nutrients. Sure enough, it was!! Wow, your son sounds very impressive! I love hearing about kids doing nutrition projects. Good for him. Have him email me if he has any specific questions. Melissa this is such a great post! I have a new client who I suspect has celiac and possibly hoshimotos too. She has had issues with anemia and is unresponsive to iron supplementation. Your post is a great way to pull it all together. Thanks! Thanks for your comment, Christianne. Your case is very common. Good luck in the drawing. This looks like a fantastic book! I’d love to win. Thanks! I have to say (even though I’m half of the writing team), it IS a good book. =) Good luck! I have had chronic anemia for more than 25years. I have lots of malabsorption issues. This spring was diagnosed gluten intolerant. I think this would help me greatly! Oh, Kelly S, I’m sooo sorry you went so long undiagnosed. Geez, that is a DRAG. But, you can help reverse some of the damage gluten caused by adopting a healing diet. Anti-inflammatory foods with lots of organic veggies. Good luck and best wishes for your health! Thanks for your comment. Celiac runs in families for a reason (it’s genetically predisposed). It really doesn’t matter if you’ve been diagnosed or not, as long as you take the GF diet seriously. No cheating. Ever. =) Good luck. And Merry Christmas to you, as well!! This was a great article! Thanks for the giveaway, please enter me! Thanks for your comment. You’re entered!! Good luck. I had severe anemia before being diagnosed with Celiac, not I think my fatigue is due more to other food sensitivities, candida, leaky gut syndrome and adrenal fatigue. You’re on the right track. It’s rarely ever just one thing (unfortunately), which makes it hard to tease out all the factors. Having said that, gluten is often the main culprit! Great post, Melissa! Much needed info. What a great topic! I was severely Anemic for 10 before doctors figured out I had Celiac Disease. Thanks for sharing the science and food suggestions. Gosh, I cringe when I hear these stories about people going for so long without being diagnosed. That’s part of our family story as well. Sending healing energy your way! I was recently diagnosed with a gluten allergy. My doctor decided to test me after I went in complaining about fatigue, low energy, etc. My iron levels were very low at the time. After only a little more than 3 months gluten free, my iron levels are now normal. I wish I could say that my energy levels have improved, but I’m hoping they will in time. Well, that’s a great start to recovering! You might also evaluate other lifestyle factors (sleep, stress, exercise, etc.) to see if there are additional issues involved with your energy levels. Hope you feel better soon! I was diagnosed with Celiac disease about three weeks ago and am scheduled to see a nutritionist in the next week or so. I am attempting to go gluten-free on my own until that upcoming appointment. I am anemic and tired all the time. I would love to have the opportunity to receive this book. I need all the resources I can get right now. Any other suggestions are appreciated! Thank you. First off, I’m so glad you were diagnosed and you’re seeing a nutritionist. I find the easiest way to deal with this is to choose whole foods as your foundation, as they are gluten-free by default and also healing. Food is information to your body. Organic, fresh food (veggies, fruit, etc.) provides the body with nourishing building blocks to heal, recover, regenerate. Good luck with everything. There’s a bit of a learning curve, but you’ll eventually get the hang of it. Just avoid (or at least greatly eliminate) processed food and you’ll be on your way. Let us know what happens after you visit the nutritionist. Were you diagnosed with any other food sensitivities (dairy, corn, soy, etc.)? What a simple straight-forward explanation of how RBCs function in the body. Thanks, I look forward to reading more. Thanks for your comment. That’s my goal — to make some of this science talk more applicable to real life! Thanks for all the info! I just got tested for celiac yesterday… waiting for the results now. I have been feeling fatigued lately but not sure if it’s the dark winter season. Even if your test results come back negative, consider going on a healthy gluten-free diet. The test results aren’t perfect and many people with negative results thrive on a GF diet. Keep us posted! As always, an insightful look at the many ways our bodies can be deeply affected by celiac. My dad had tanked hematocrits and was surely an unDxed celiac his entire life. I had B-12, folate and D defs, but my ferritin storage levels were within range. If someone’s iron levels seem “normal”–but they still feel tired and sluggy—it could be low folate. (I felt like I was dragging myself around for a few months post-DX, but proper supplementation brought it back up). Now, I eat folate and iron rich foods and have no trouble. I love your articles, Melissa. Thanks for sharing your knowledge! I have your book already. It should be required reading for all gluten intolerants. And thanks for your support of the book. That’s also much appreciated. Have a great holiday! Best wishes for a joyous holiday, hon!! I am making your Mom’s version of yummy cheesecake for Christmas Eve. I have no doubt it will be a hit. My long-standing recipe may take a back seat. Thank you for sharing so much of yourself with the GF community and for always being so gracious to take the time to answer each and every post made on your blog entries. That, in itself, speaks volumes. You’re a doll. Many blessings to you, Melissa. 3 years anemic with ibs now just found its coeliac if only i knew earlier only went to docs as changed stuff so had no stress but still had ibs symptoms. Docs often treat the symptoms (like in IBS), rather than figuring out what causes the symptoms. Glad you found out! The book sounds awesome – especially for my boyfriend that is a cyclist! Yes! There’s great info for cyclists. And some cyclist athlete profiles. Interesting stuff! Thanks for your comment. Another sign of iron deficient anemia is fingernails that grow curving over the fingertips. This was a major irritation for me until I got ALL the hidden gluten out of my diet (not easy I might add) and started a special diet to heal my leaky gut. All of a sudden one day I noticed my fingernails had grown out straight and strong! Katieb, I’ve heard of odd fingernail growth with nutrient deficiencies. Very interesting about iron and curving fingernails. Glad you got it all figured out. I know, it’s not easy to be 100% gluten-free all the time. Gluten is hidden in so many places. It’s tricky stuff to eliminate, that’s for sure. I like everything on that food list. Who knows if I’m lacking iron, sometimes I might be I think. Sometimes I do feel tired when I shouldn’t. I love your articles Melissa, they are always so interesting on every level. You are such a good writer. Oh, thank you so much for stopping by. And thank you for the kind words. Coming from one of my favorite writers makes it all more meaningful! Speaking of corsets, I took the most interesting “corset” photo while in New York City last weekend. I’ll email it to you along with a quick message. I should have had you meet me in NYC. =) I went to visit my daughter and take in the Rolling Stones first US stop on their 50th anniversary tour. It was a mother/daughter night at Pure Food & Wine (organic, raw, vegan restaurant) followed by some rock and roll. I must say, Mick and gang (average age 68-ish) still rock the house. We thank you for your awesome contribution to the music scene. What would we have done without you Brits?! Take care and have a wonderful Christmas. More soon! You are so awesome. Thanks for all you do! Learning a lot these days on autoimmune illnesses. Thanks a lot for the information. Would love to read your book. I’ve been anemic for a little over four years now. I research all the time since being diagnosed with Celiac. All books are welcome in my home. Crossing my fingers and toes…. I have been diagnosed with Celiac for 5 years now and have severe problems with anemia, making me so tired, it takes all I can do to get through my days. Other than being gluten free and my iron supplements I dont know what else to do. I would love a chance to win your book, hopefully I can find some help in it. First time here, I have iron-deficiency anemia and have been DX with Celiac Disease just coming up on a year. I have been struggling with keeping my numbers up and in a healty range. Vitamin D is almost non-existent. I love your simple straight-forward explanation of how RBCs function in the body. Thanks, I look forward to reading more. Hi!I just found your page through nourishing meals which I’ve been following for years and extremely excited I did! Recently I found out I have anemia which is thought to be from my athletic life and dietary choices (no meat). Again, super excited I found you, so much so, I had to tell you!